You haven’t met me yet, but you will soon. I’m going to be the star of the Cranberry Cove series which debuts in August 2015. I ran a small café in Chicago for a couple of years, but when a big chain coffee bar moved in across the street, I went out of business. My stepbrother Jeff needed help on his cranberry farm in Michigan so I packed up my bags and headed to the mitten state. Cranberries are a lot of work year round—sanding the bogs in the winter, fertilizing in the spring, keeping the weeds down in the summer and finally harvesting in the fall. Seeing all the cranberries float to the top of the bog after it’s flooded is a beautiful sight—the colors are so rich. The berries appear red, but if you look closely, you will see all shades from light pink to almost black. Cranberry Cove is a charming town right on Lake Michigan with a horseshoe-shaped harbor and lovely beach. Pastel colored shops line Beach Hollow Road—most of them are for the tourists who flood the town in the summer. The locals hang out at the Cranberry Cove Diner, and I love Book ‘Em, a bookstore devoted to mysteries. You wouldn’t think an idyllic town like this would give rise to murder, would you? Author’s note: We are still working on a title for the first book, and I will keep you posted! The Cranberry Cove series debuts in August of 2015. Meanwhile, if you enjoy culinary mysteries, I write the Gourmet De-Lite series set in Connecticut, and under my pen name of Meg London, the Sweet Nothings Lingerie series set in Tennessee. My e-book series “The Lucille Series” is available for all platforms and features middle-aged Jersey housewife Lucille Mazzarella. 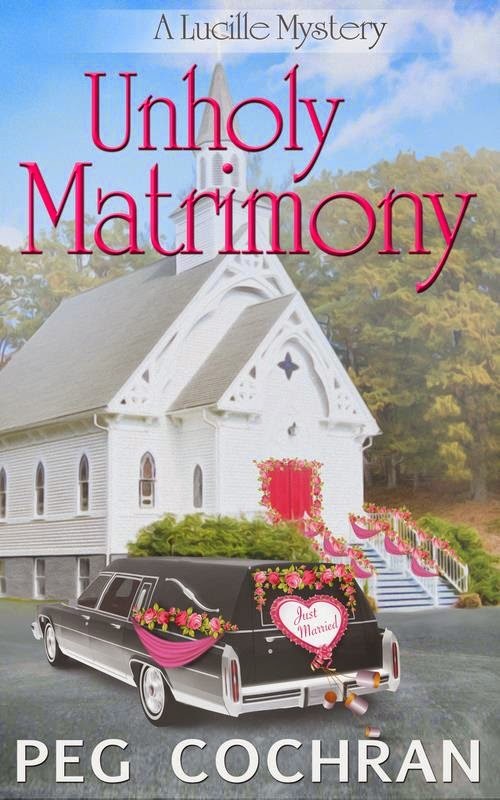 I am giving away the second book in the series Unholy Matrimony to one lucky winner! Just leave a comment below to be entered! And be sure to check back on Sunday to see if you've won! Love the sound of your newest series. The new series sounds great! I have been wanting to read the Lucille series. Thanks for the chance to win. I love your Gourmet De-Lite and Sweet Nothing series. I'm looking forward to the new series also. I haven't read the Lucille series but will add it to my TBR tower! Sounds like a great new series! I would love to read more Lucille though!! What an amazing sounding series. I have enjoyed your De-lite series and look forward to reading your Cranberry Cover when It becomes available. Can't wait to read the new series!!! how did I not know of this series?!?!?!? Very excited for your new series! This is an entertaining book. Peg, I've loved all of your books and can't wait to read this one! Your series are wonderful and this new one sounds like a winner. Can't wait for it to be released. Sounds like it'll be an interesting series. I love homeemade cranberry sauce with orange peel so I know I would love this book. Sounds real good to me. Love Peg's books so this should be a good series too. Can't wait to visit Cranberry Cove! Cranberry Cove sounds like a town I'd love to live in. Sounds like a good new series. I made my own cranberry relish for the first time last year - yum. And a mystery book store - I'm there. I love cranberries and think it would be so neat to see a cranberry bog and harvest (aside from the Ocean Spray commercials!). I look forward to the new series! I got to experience a wild cranberry bog years ago. Quite amazing and pretty...and cold. Your productivity boggles the mind! So many books and all such run reads. I love finding out about new locations and professions in the cozy mysteries I read. This looks like one that will be very interesting! Sounds like a great series! I grew up in Michigan and love the towns in the UP. New series sounds good , I will be checking it out! I am hoping to win! I'll be sure to check this out next year. Thanks for the quick glimpse. Cranberry Cove sounds like a delightful little town. I'll be anxious to "visit" it when they book comes out. Hooray for a new series! Sounds like a great one! I'm still amazed at authors who can write several different series. But, I do thank you, because it gives me, a reader (only), so many good stories to enjoy. I like series and this sounds like a good one. Looking forward to Cranberry Cove. Michigan cranberries used to be a well kept secret.